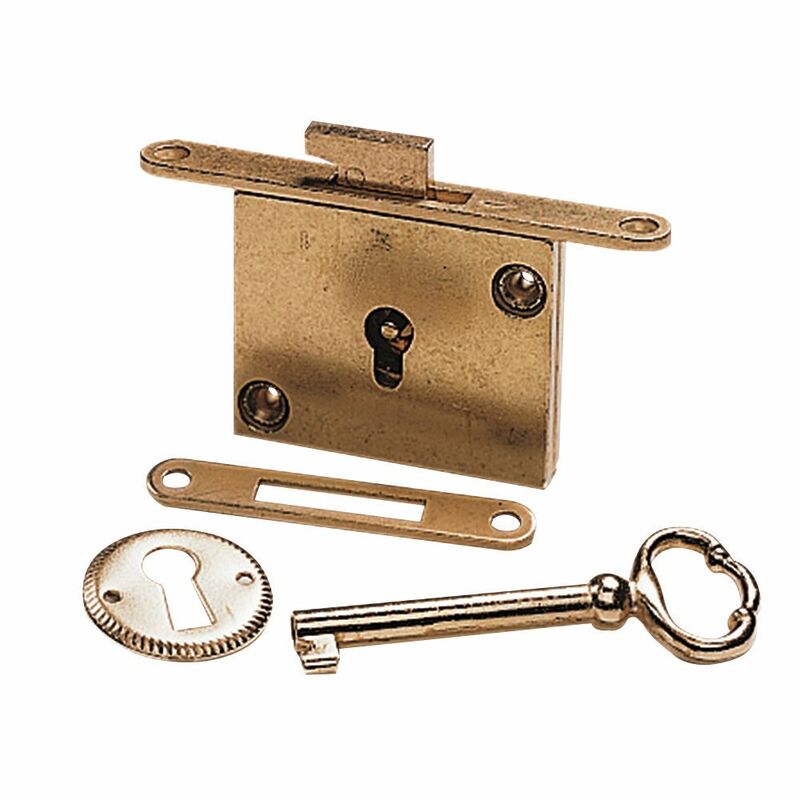 Brass plated lock requires 2" L x 1-1/2" D x 5/16" mortise. Escutcheon provided. Selvedge is 3/8" x 3-1/8"
The lock and key are great but the escutcheon is a little disappointing. Its a little too big and not the quality of the rest of the lick set. Worked great! So happy I found Rockler hardware. I know where to look now! Classic look and feel for traditional work. Smooth turning action. Comes with all the screws and keyhole trim. Very nice. A template for locating the keyhole would help. Excellent working lock and well built. 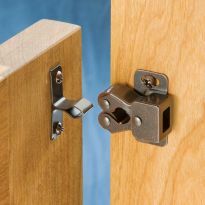 Only complaint is the nails for the key plate are a touch long when lock is installed in wood less than one inch thick. 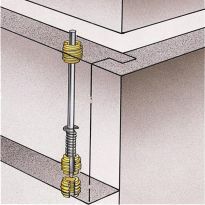 Easily fixed with short brass screws or a predrill and snipped nails. I bought the full mortise lock for a treasure chest I made as a Christmas gift for my wife. The challenge, of course, was how to machine the full mortise using my crude woodworking tools. The lock's flange plate is little over 1/4" wide by about 1/16" thick. I set my router fence a little off center of the board, with the fence a shade toward cutter. I used a 1/4" straight cutter and made two passes, flipping the board in between passes. Two stops clamped to the fence determined the length of the cut. I highly recommend using a couple of test pieces until you are confident in your setup. The lock's mortise was a real challenge, working in oak with only a Chinese drill press. I first selected a brad point bit slightly larger than the thickness of the lock. then I marked centers equal to the diameter of the bit, along the centerline of the previous mortise. To my surprise and delight, the lock fit perfectly! The "latch plate" Was a different story. My plan was the same as for the 1/16" mortise for the lock. I measured and marked and marked and measured and setup the router for the cut. The mortise for the latch plate was perfect! I used the same technique as before for the clearance for the latch using the drill press and chisel. Once assembled I tested to latch and found it didn't catch in the latch plate. As it turned out I moved the latch plate twice before I got the latch to catch in the latch plate. That's why God made wood putty and paint - to make us the carpenters we ain't. 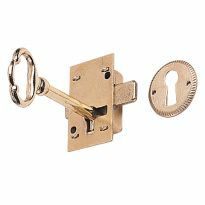 My advice for the first timer is to actuate the lock with the latch plate sitting on top, until you understand the motion of the latch and then locate the latch plate. In spite of my mistakes, the result is beautiful and my wife loves it! turning a cedar chest into a safe. This item is great. haven't installed it yet, but should be a fairly easy project. This mortise lock is wonderful! They look great, and very easy to install. We make boxes for weddings, so we use a few of theses locks every month, Never had a problem with them. Plus the shipping is fast too. Built for my 2 year old grandaughter a chest to be used now as a toy chest and a hope chest later. Chest looks like and antique has hand cut dove tailed construction so the lock went well with my intent and functions excellent. Well made and easy to install. Works very well. I thought this would fit perfect for the project I was working on, Cedar Chest. But, it was not very easy to install, the alignment of the lock mechanism and the lid was a nightmare. I had to refill holes and start over, twice, and it still isn't working as planned. The only thing that I see with this product is that only comes in brass. It would be nice if it came also in oil rubbed copper. I used this lock-set for a small table that I was refinishing. The lockset was missing so this one worked pretty well with some minor adjustments to the opening in the drawer. I have been very happy with these locks so far. I find the enclosed strikeplate is too thin & would have to be inletted too deep in the top. I have been making them from .090 brass from the harddware store & they work great. I will be buyuing more of these locks. They work very well on my treasure chests. I was generally very happy with this lock-set especially for it's price point. Simply but charmingly detailed, and nicely electroplated, It appeared to be durable and sturdy enough to last for generations. Thanks to it's considerate dimensions which were obviously established to work in tandem with standard sized router bits, upon fabricating a jig was also easy to mortise and install with essentially perfect tolerances. The only issue that I found (fortunately) before I committed to the upper strike plate mortise was that the throw of the strike when fully extended barley caught the edge of the strike plate. I resolved this issue by cheating the strike plate off center by about 7/64" which still allowed the strike to move freely through the strike plate void while catching the strike plate edge with a tolerance that I was considerably more comfortable with. My use for these locks(2) was for a very large chest. I believe it is intended for smaller projects, but it works well. Alignment of the latch and strike are a bit tricky but with a bit of care it is doable. One of the locks I ordered was defective and was replaced quickly and without hassle by Rockler. Their staff was friendly and responsive. I mortised this into the 5/8" thick wall of a small box but the enclosed escutcheon brads were way too long. When cut, they didn't grip and I ended up epoxying the escutcheon on. Easy to install and works great, but have some issues with adjustments and brass coloring. Easy to install. Worked get as a reproduction replacement. The lock looks like well made but does not match in size to the one I want to replace. Lock arrived promptly and in good condition. The lock worked fine but the construction is a bit crude. For the hope chest I am building it should be fine. For an application where it would be used more it might not last. Installation fairly easy, lack of cut out diagram and dimensions caused some issues. Finish not as dark as I hoped. Lock works well. Chose this lock because the selvage is 3/8&quot; wide. Very easy to install, however there is a gap between lock plate and the finger that catches in it. Causes the lid to be able to be raised about 3/16&quot;. No instructions come with the lock that addresses this. 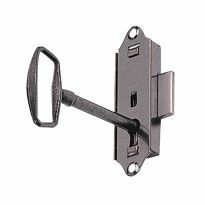 Other than this, this lock is a great value and it can be used on a door or a lid to boot. I've used quite a few of these and they all have worked but they are very cheaply made. Obviously they are built to a price, but the surface finish is especially cheap looking and the stamped escutcheon plate's hollow back only adds to the impression of cheapness. I use them because they are apparently the only lock of this type and configuration still in production, and that's what I need. I guess there's just no market for a better one any more. Lock mechanism is great. Disappointed in the finish. Finish looks more like a flat goldtone unpolished metal than brass plating. this makes the lock look cheap, especially if you are going to put it in a nice piece of furniture. This broke after less than a dozen uses. Key flops around in hole. Don't waste your money on this. Removed the lock from the package to test it out, after a half dozen turns of the key it refused to retract the bolt. Returning this piece. Building a large cedar chest. Like the antique look. 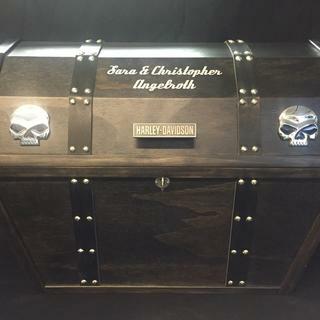 I'm building my son's wedding gift - a large box similar to Woodworking Magazine's "1839 School Box" and need a lock for it. I like the clean look of these for large chests. They aren't the best for security but serve the purpose. It was the lock that fit my antique trunk. Have used twice before and it works very well although the key could be stronger. Have broken one in the past. I am building a Prayer box for a lady minister I know and this is just what I need for the box to be locked. Antique secretary door had no lock in the cutout for it. Wasn't sure if this would fit but can use it later if it doesn't. It will finish off a ‘secret’ box I’m working on. I have used this in the past. Great little lock for small boxes. I was able to pirate/adapt the quadrant hinge jigs for easy installation. Buy the deep router bit and take your time. seems appropriate for my chest. Made several cases with these. work good & reasonable price. made well and is just what we needed for our granddaughter blanket chest. Replace the old lock chest. I am jealously possessive of my wife's chest and I want to lock it up when not in use. I chose this so I could put it in a telephone table with a drawer that I'm building. Suggested by a friend and fits the project I'm trying to do. How else would I protect the cigars? replacement for one that is binding and doesn't full function correctly. Will work well on my flintlock pistol case. I wanted a simple lock for a Hope Chest I made for my granddaughter. for small boxes that I make I some times add locks. Looked like the only think that would meet the needs of the casket I'm building for my granddaughter who will not live long after birth. Looks to be ideal for an oak dove tailed box I am making. Are the keys for this lock universal? If I order several locks will the keys be interchangeable? BEST ANSWER: Yes, each lock is the same. One key fits them all. I only used one of these, but the simplicity of the design leads me to believe it would be interchangeable. After using one of these I'd say they are universal. It is basically an old skeleton key. 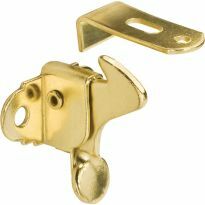 What screw size does this latch use? BEST ANSWER: Mine came with screws and I have put them in place, so I'm not sure what size they were. They are brass, so I had to be careful to make the whole large enough, that the screw didn't break off. I had one break off! medium sized steel screws secure the lock mechanism. Smaller brass screws for everything else. Not sure of the size, but it does come with the screws. What is the backset for this? BEST ANSWER: Just about anything will be ok. I centered the lock set in 5/8 thick cherry stock. I would go thicker in softer wood. I was very happy with this lock. From the face of the latch body to the center of the key pivot measures at 0.785 inches. Hi, I am very much interested into that lock. 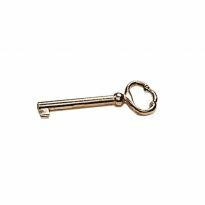 Is it possible to buy an extra key? In case I lose the one we get with the lock, what should I do? BEST ANSWER: I don't know you would probably need to look in a Rockler catalog. indeed and I did. I have seen they also sell individual extra keys! Thank you for your answer. What are the dimensions of the latch & plate? can it be installed in 2/4" thick wood?